Advertising influences most consumers in their purchasing decisions, according to a survey of 1,030 U.S. consumers. Americans are exposed to up to 10,000 advertisements every day, a number that is rapidly growing with the increase of advertising channels and new technology. Businesses need to advertise in multiple mediums to reach consumers during their everyday activities, whether it’s watching TV, reading a magazine, or browsing on social media. With so many advertisements, it’s hard to understand which ones consumers trust and act on. 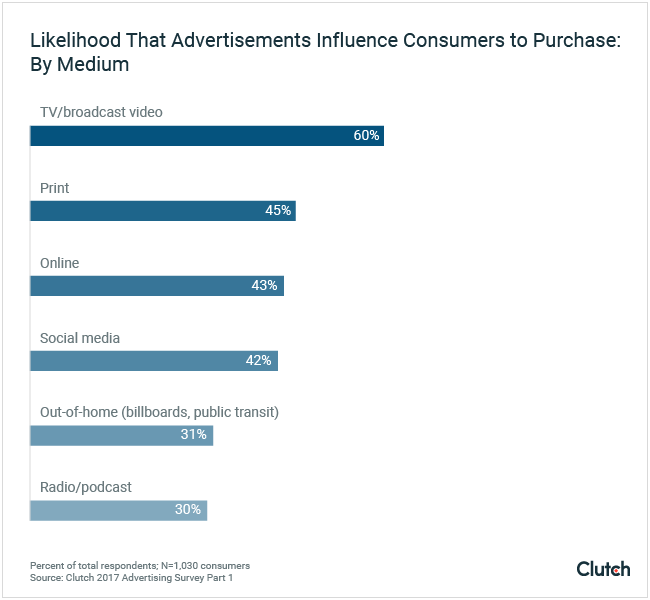 With this in mind, Clutch surveyed 1,030 consumers from across the U.S. to determine their trust in advertising and how advertising influences their purchasing decisions. Advertisements influence 90% of consumers to make a purchase. Consumers make purchases after seeing or hearing an advertisement on TV (60%), in print (45%), online (43%), and on social media (42%). 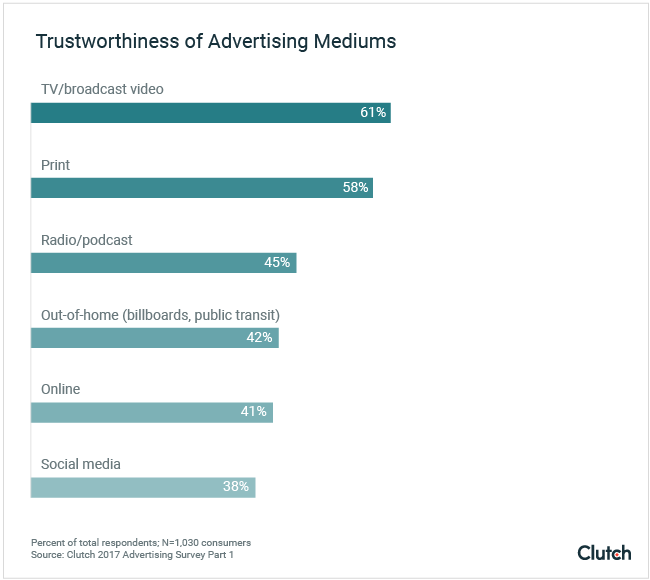 Advertising through traditional mediums is seen as the most trustworthy: 61% of consumers trust TV, print (58%), radio/podcast (45%), and out-of-home (42%). The least trustworthy advertising mediums are online (41%) and social media (38%). Advertising influences 81% of millennials ages 18 to 34 to make a purchase and just 57% of Baby Boomers 55 and older. Those with a higher household income (55%) are more likely to make a purchase after seeing or hearing an advertisement than middle (48%) and low (45%) household incomes. Advertising influences almost all consumers to make purchases. Only 10% of consumers said advertisements do not influence their purchasing decisions. TV is the most influential medium for advertising. About 60% of consumers are likely to make a purchase after seeing or hearing a TV advertisement. TV advertising is the most influential because it is the most expensive medium of advertising and successfully connects with consumers, according to Rob Albertson, managing director of Bandwidth Marketing, an agency with clients such as Allstate, Taco Bell, and Tropicana. Consumers are most influenced by TV advertisements because they inform consumers about a product more than other mediums. Companies in a wide range of industries can use TV advertisements to stand out. For example, Dallas patio furniture store Sunnyland Patio Furniture uses TV advertisements to help show off its products. Sunnyland’s commercials feature shots of its outdoor tables, chairs, and couches with a voiceover description. 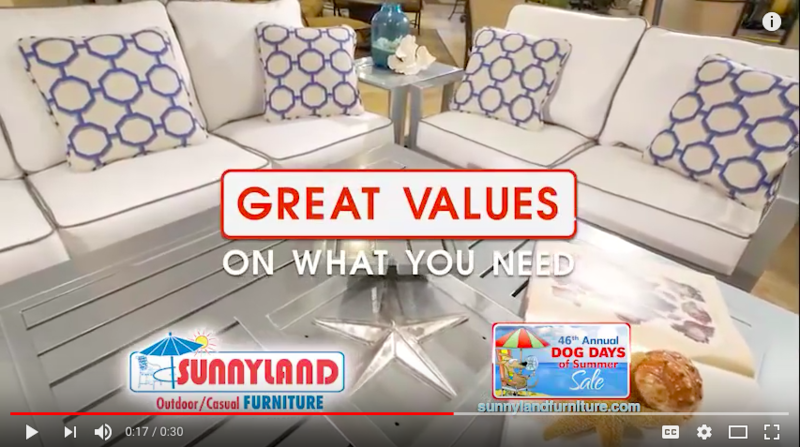 TV advertisements benefit companies like Sunnyland Furniture through informing consumers about the brand and product using visual and audio cues. Print, online, and social media advertisements also influence consumers in their purchasing decisions. About half of consumers are likely to make a purchase after seeing or hearing print (45%), online (43%), or social media (42%) advertisements. Some companies mainly advertise online, such as RapidVisa Philippines, which aims to simplify and expedite the visa process to reunite families in the U.S.
RapidVisa uses online advertising to reach its target audience. For RapidVisa, advertising builds consumer trust in the company and ensures more people are reached. Consumers are least likely to be influenced by out-of-home, such as billboard, posters, or public transit advertisements (31%), and radio/podcast advertisements (30%). Consumers are likely distracted when they come into contact with these advertisements. 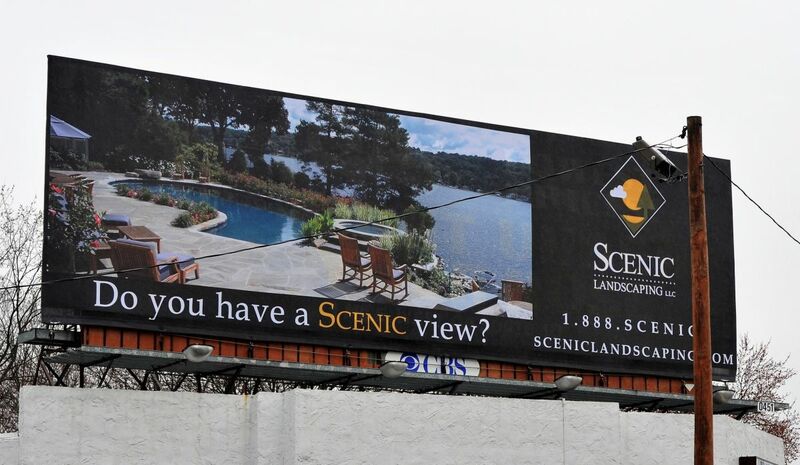 Many companies, such as Scenic Landscaping in New Jersey, have tried out-of-home advertising in the past but found it is not as influential as other mediums. Billboard advertisements are large and recognizable, but many do not result in increased sales. “We tried billboard advertising in the past, and while it was exciting to have such a large presence on the highway, it not did bring in much business for what it costs,” said Heather Knapp, Scenic Landscaping director of marketing and advertising. Knapp says the advertising mediums that work best for her company are magazine and online, rather than out-of-home. The most influential advertising mediums for consumers are also considered the most trustworthy. Consumers trust TV (61%) and print (58%) advertisements to be the most honest in their messages. The least trustworthy advertisements are the newer forms of advertising; just 41% of respondents trust online advertisements and 38% trust social media advertisements. Respondents distrust online and social media advertisements because they are unregulated and easy for companies to create. Less regulation of newer forms of advertising compared with traditional advertising is a point of skepticism for consumers. The recent increase in “fake news,” or hoax news stories, has not affected consumers’ trust in advertising, according to experts. Advertising is held more accountable now than it was in the past. Consumers are also able to determine the differences between an advertisement and the program it sponsors. So, despite whether they consider the news outlet they are tuned into as fake, consumers don’t necessarily see advertisements on that outlet as fake. Millennials are more influenced by advertisements than older generations. Advertisements influence the majority of millennials aged 18 to 34 (81%) to make a purchase but just over half (57%) of Baby Boomers who are 55 and older. 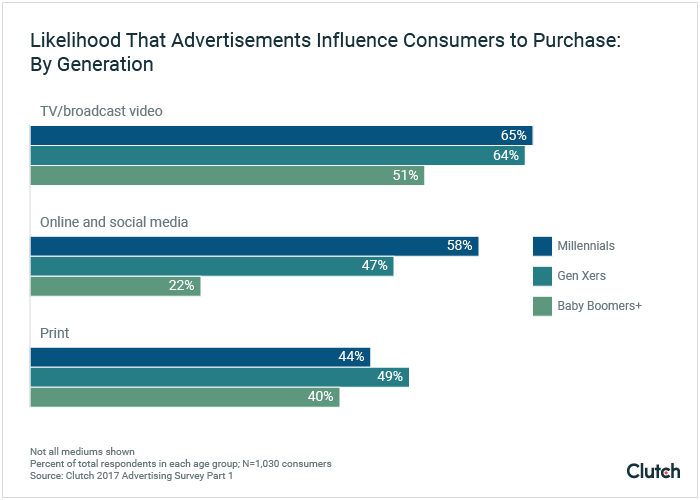 TV is the most influential advertising medium for every generation, but millennials are more likely to make a purchase after seeing or hearing an advertisement on most mediums. A larger percentage of millennials are likely to make a purchase after seeing or hearing advertisements than those 35 and older. This is due, in part, to the fact that older generations have already developed their preferences and are not as influenced by advertisements. Advertisements cater to the spontaneity of millennials, which explains why younger generations are more likely to make a purchase after seeing or hearing an advertising on all mediums, including social media and online. Many companies that target millennials, like clothing outlet INTO THE AM, advertise mainly on social media and Google. 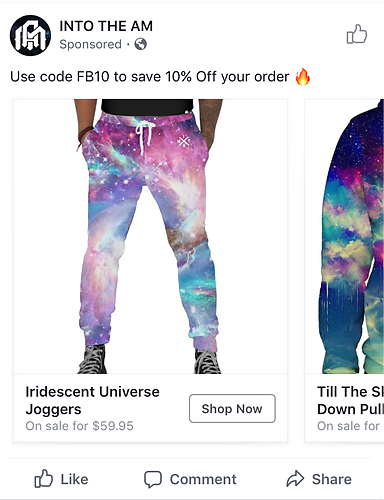 INTO THE AM’s advertising focuses on the clothing’s bright, vibrant colors and creates a visual appeal that is successful with millennials on social media. Younger generations are the most trusting of advertisements. Over half of millennials (55%) and Generation Xers, ages 35 to 54 (53%), trust advertising. Less than half (44%) of Baby Boomers trust advertising. The older generations trust advertising less because they have seen dishonest advertising in their lifetimes. Millennials trust advertising more because it is easier for them to find out if a brand’s message is misleading. Millennials also trust most advertising mediums more than older generations. The discrepancy of trust between generations is less pronounced with traditional forms of advertising than with newer advertising mediums; around half of millennials trust online and social media advertisements (51%), while just 27% of those 55 and older do. Advertisements are more influential to consumers with a high household income. Nearly all consumers (83%) with a household income of more than $100,000 are likely to make a purchase because of an advertisement, 15% more than those with a lower household income (68%). 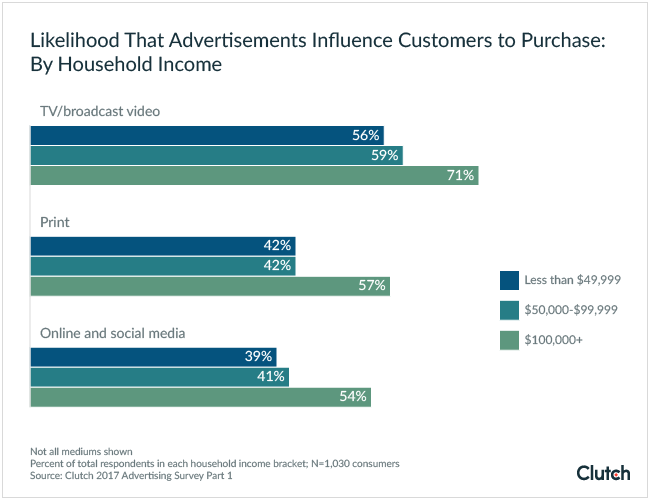 High household income earners are at least 10% more likely to make a purchase after seeing or hearing advertisements on every medium than the lowest income bracket. Higher household income earners can be more relaxed with how they spend their money than lower income households, who may be skeptical of the messaging of advertisements. Because the wealthier households have a higher disposable income, they don’t have to be as careful with their spending habits. As consumers’ household incomes increase, they are more likely to trust and be influenced by each advertising medium. Less than half (47%) of consumers with a household income of under $49,999 trust the message in advertisements to be accurate, while 61% of those with a household income of more than $100,000 trust advertisements. 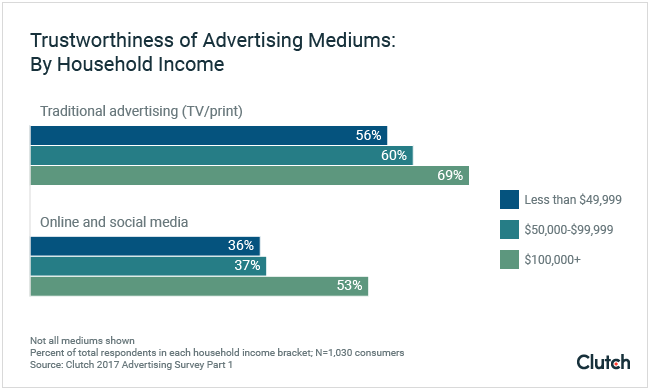 Those with a higher household income also trust each advertising medium more than lower household incomes. Consumers with a higher household income trust advertisements more than lower household incomes in both traditional and newer mediums. In order to engage with consumers, businesses need to advertise through multiple mediums. Whether they’re on their smartphones, computers, TV, or radio, consumers are exposed to thousands of advertisements every day, and companies that want to reach the most consumers should advertise in order to succeed. Rob Albertson agrees that a company’s chance of success increases with advertising. “Unless you are willing to go door-to-door and shake every hand to convey the uniqueness of your product or service, you need some type of broader vehicle to get your message out there,” Albertson said. Companies need advertising to spread their message. 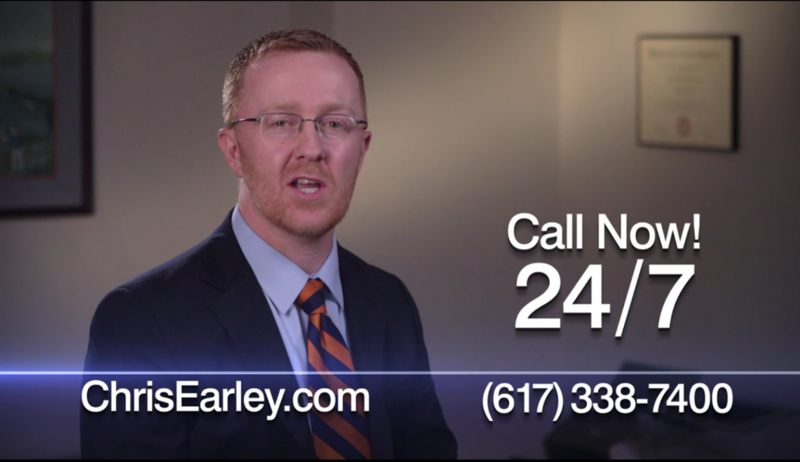 Boston personal injury attorney Chris Earley, for example, advertises on TV, Google, and in newspapers, among other mediums. To find the advertising agency that’s right for you, use our directory of the best advertising agencies with verified reviews. Advertising continues to influence consumers’ purchasing decisions across most mediums. 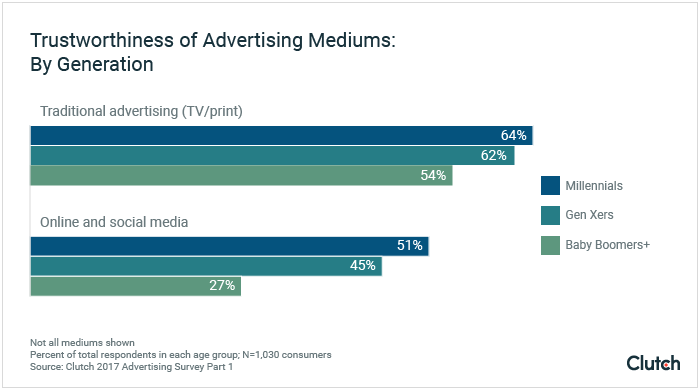 Consumers trust traditional forms of advertising, such as TV and print, the most, despite the increase of online and social media advertising. Businesses should advertise on multiple mediums to reach consumers through their everyday activities: browsing online, watching TV, listening to the radio, and reading print media. Clutch surveyed 1,030 consumers in the United States who have seen or heard an advertisement in the past week.